A while ago, I sat in a coffee shop trying to clear my head and write, but found more interesting subject matter eavesdropping on table conversations over lattes. Gentleman: That weekend won’t work. It falls over the Easter bank holiday. Lady: I never remember, is Easter about Jesus’ birth or death? Gentleman: Death. And then he came back to life. Yeah, that sounds about right. I thought again about the couple’s conversation while decorating our home for Easter. While I had no qualms telling our daughter the Christmas story of baby Jesus; I have shied away from the Easter story as, frankly, it is too complicated for little brains. You can sing “Happy birthday, Jesus” with a two-year old, but “Christ the Lord is Risen Today” gets to be a bit of a tongue twister. To be honest, I dodge the subject of death entirely. I do not even like to call a dead bug dead. It is squashed. And since I cannot explain death, I have not even attempted chatting resurrection over a bowl of Cherrios. Last week, Ouisie was read “The Old Woman Who Swallowed a Fly” at her playgroup. She became fixated on the old woman swallowing the spider that wriggled and jiggled and tickled inside her. There was an old lady who swallowed a horse…She’s dead, of course! …so I let that small detail slide. Instead, I agreed spiders were YUCK and meant to stay outdoors! As a child, I attended Sunday school, and always had a perfectly pressed dress for Sunday service. I knew my Bible verses and church songs by heart. Looking back, I do not recall ever feeling scared by the lessons on the crucifixion story. Perhaps my classes did not focus on His death, but on the joy of His resurrection three days later. The first time I experienced mourning the loss of a loved one was the summer before I turned eight, when my beloved Grandfather died. I was old enough to grieve, but not mature enough to grasp the finality of his death. 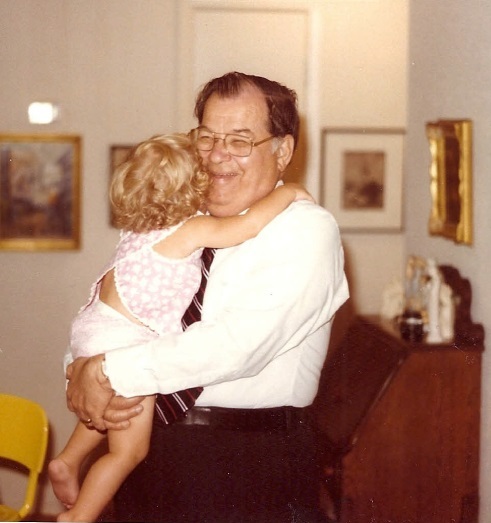 I recall being perplexed about how Grandpa could no longer be with us, but his spirit was allowed to stay. I was frustrated that my parents could not tell me exactly where heaven was located, and even more annoyed that we could no longer chat except in my prayers. While I got used to Grandpa not being at birthdays and holidays, I never stopped wishing he could come back to join in the fun. 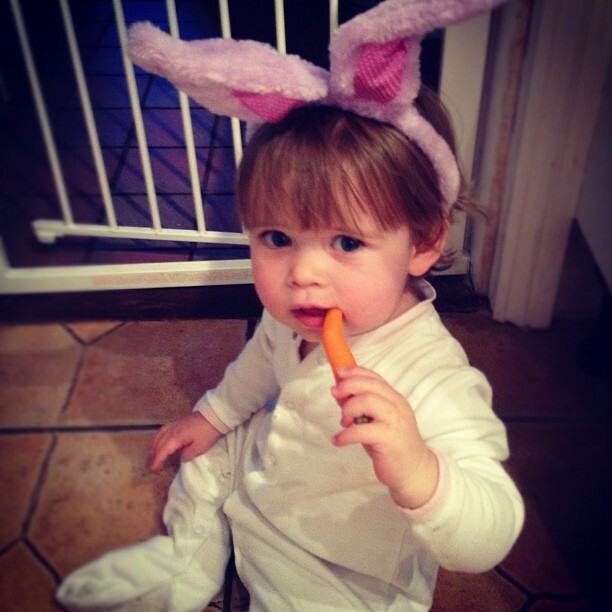 This morning we watched our daughter discover the chewed carrot left for the Easter Bunny, and skip around the frost covered garden filling her basket with chocolate eggs. 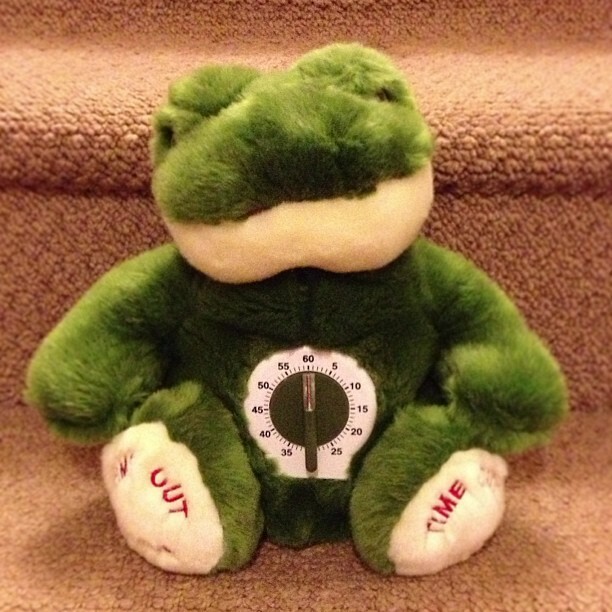 Later that same morning as I sent our rebellious toddler to “time out,” I had a eureka moment. 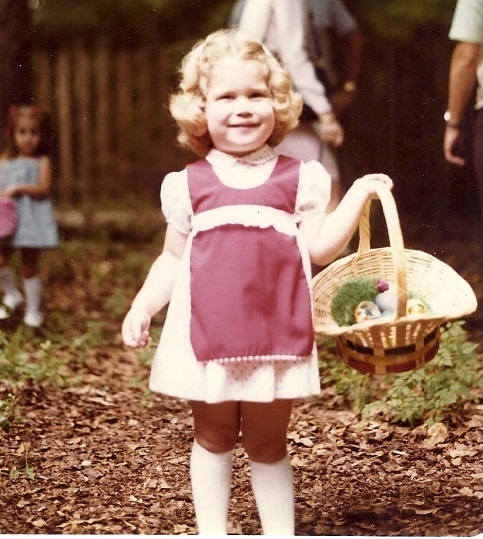 Time out corrects bad behavior, but also illustrates a parent’s redeeming love for her defiant child; a parallel to a prominent lesson of Easter. While Ouisie sat for her two minute time out, on a much smaller scale, I realised how we, as parents, also make sacrifices for our children on a daily basis. There are little offerings, like the shirt sleeve to wipe a runny nose or sleep deprivation from a night of bad dreams. And bigger ones, like putting a career on hold to be at home full time, or saving money for a college fund rather than a luxurious beach holiday. Two years ago my priorities shifted forever with the birth of our daughter. Instantly my schedule shifted to revolving around her needs and activities rather than my own. There are moments when I want to crawl in a corner and cry because my patience and nerves are frazzled. I would love nothing more than to get ready for the day without going to battle over combing hair and brushing teeth. But parenthood is not easy or perfect. It is a long journey and a huge learning curve for both parent and child. The full Easter story will be told in a few more years, and I hope she will delight in understanding its wonderful message. And way (way…way…) down the road if she becomes a mother, I hope she looks back on her childhood with the same gratitude that I have of my own upbringing. Until such time, I will persevere teaching repentance through “time out”, keeping my cool and humour in check, and remind her (frequently) that Santa Claus and the Easter Bunny are watching. You're a good mommy to be including teaching these important truths to Ouisie in whatever way she can understand. Building faith is a gradual process, and you're pouring the foundation for her with every song, story and discussion you have! Great Easter message. . .